Sure to be a favourite in your wardrobe for years to come, our Ranga 31 brushed cotton fabric showcases a big and bold navy, blue and white check on a beautifully soft base. Ideal for the cooler months and as a stylish layering gown, this modern classic will last the years. Trust us, you'll want to stay wrapped up in this dressing gown all weekend! 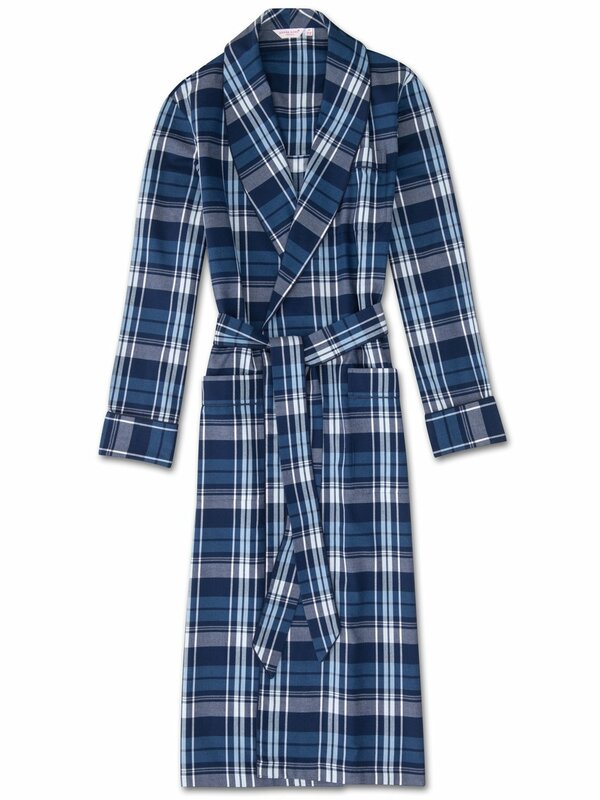 For the man who likes to lounge in style, our signature dressing gowns merge classic styling with modern fabric designs. With its relaxed fit, you can layer this gown comfortably over pyjamas or loungewear throughout the year. Crafted from a medium-weight brushed cotton, the Ranga 31 navy piped dressing gown utilises a unique brushing technique to comb and soften the fibres for an extraordinarily soft handle. The signature Derek Rose dressing gown features a classic shawl collar design, rifle cuffs, a breast pocket and two front pockets for practicality while around the house. The gown is also complemented with navy piping and a self-fabric tie-waist for an added touch of luxe.